Oh, the glorious days of old! Some people think it strange that I would like vintage perfumes – my motto is “Old is Gold” – because I am still quite a few years shy of 30. Heck, people think it strange that I would like perfumes, but hey, I like fountain pens, I like singing, I like dancing in my room when no one’s looking (well, sometimes even when others are in the room), I like reading Philosophy and countless other things. I just happen to love writing about perfume as a hobby, and I happen to really adore classical vintage perfumes too! Random soliloquy aside, I was wondering if anyone could tell me how old my bottle of N°5 is? Aside from the picture above, I can also tell you that I don’t have the box, the bottom of the bottle has the words ‘CHANEL’ printed four times, one on each edge, and that it is a splash bottle. Not much help, I’m afraid. In any case, my nose tells me that it’s certainly old, at the very least. It’s got that smell that slightly degraded perfumes have; I’m not sure if you’ve experienced it, but from what I’ve experienced, vintage perfumes that aren’t in pristine condition tend to have a sharp, slightly off and acrid note at the very top. Sometimes, and that’s when you know you’ve got a completely off bottle, that note is all you’ll get. Other times, the sharp note fades off and leaves you with glorious, glorious scent! In this case, thankfully, the sharp notes leave after around 15 minutes leaving a soft, gentle animalic floral. The aldehydes are nowhere to be found, but that’s probably because they are rather unstable molecules and so tend to react unfavourably with heat, light and oxygen (I think). 1. Are you able to date this bottle of N°5? 2. What has your experience with vintage been like? More hits or more misses? Sorry, can’t help with the date but I too have a bunch of old frags, I even like the nailpolish smell at the start of one going bad. The most I can tell you is that its after 1951 as there is no dot under the o in No. Its really hard to date the oblong EDT screw top bottles – the parfum bottles with the glass tops are easier because of the shape of the shoulders, the top, the sides and the label. I believe also that after 1987 you would find Paris/New York on the label although I’m not completely sure if that was for EDPs only. I have an embarrassingly large vintage collection emassed over several decades and its become a bit of a double edge sword with buying online. On the one hand its opened up a much broader outlet but on the other it’s increased the possibility of scams/fakes. So far though I’ve been pretty lucky – I have had a few that the top notes were obviously gone but it wasnt a disaster as the dry down was still good. I’ve never yet had a fake or anything that was completely bad. I never buy from someone who doesnt have a return policy. As a seller too, I’m always aware of how carefully you should describe the perfume and I test those I resell before putting them up for auction. I wish more people would do this but many dont have a clue what they have/ what it should smell like. I also buy from estate sales, flea markets etc where you have more control on sniffing. I know what you mean about it being a double-edged sword to buy online. That said, things have improved, with regard to eBay, at least, especially since they provide more buyer protection these days. We need more responsible sellers like you on the market! I would love to go for an estate sale, but unfortunately this does not seem to be common in the UK. Followed your comment on Bois de Jasmin’s website (and I thank you for my birthday wishes!) 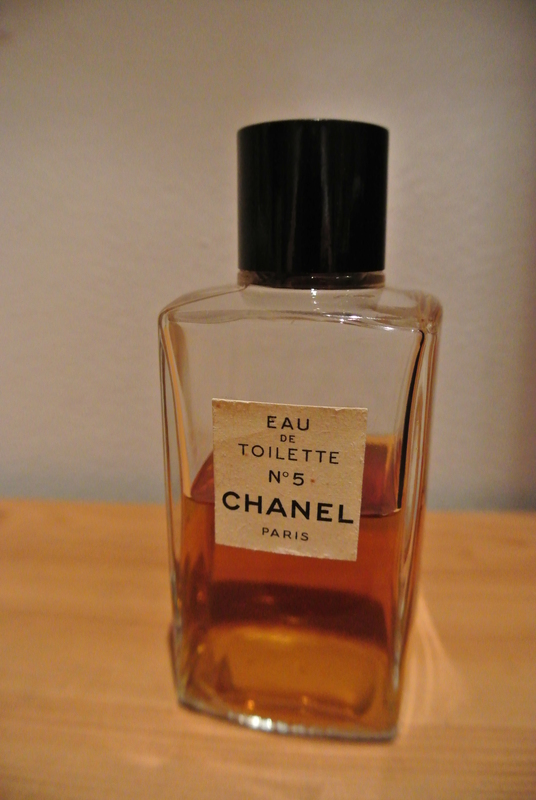 to your blog and wanted to let you know I, too, have an older bottle of Chanel No 5. I can tell you what mine looks like, in case it helps you date yours in some way: mine is also a splash (not a spray). The bottle is smallish (about 3 1/2 inches, including the cap). It’s Eau de Toilette. My label doesn’t have the word “Paris” under the Chanel. The bottom of my bottle only has the double C (entwined), as does the lid. The lid has the double C incised. I doubt that helps you in any way, but – like you – I love the vintage bottles. Most of my forays into buying something vintage have been mostly misses. I’ve found that in trying to recreate a period in my youth, the memory still eludes me. Unfortunately! Thank you for sharing! Perhaps someone ought to release a definitive guide on how to identify and date bottles of Chanel No. 5!